Having never seen the movie, I figured it would be a great idea to pick up and review Happy Feet on GameCube from my local library. It turned out to be about as fun as you'd expect (not very). 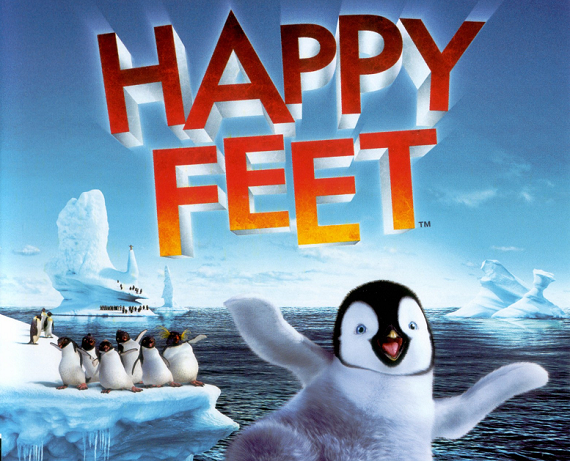 Happy Feet, the game, retells the story of the movie - I assume anyway, I haven't actually watched the movie - via decently well-animated and fully voiced cutscenes which seem to even have the original voice actors from the movie. 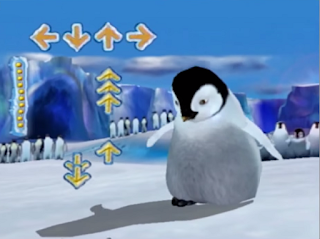 Without having seen the movie, I was able to get the gist of the story of how Mumble the penguin was an outcast because he couldn't sing and was more interested in dancing. Penguins hate dancing apparently. In the end, he ends up saving everyone in some way that wasn't quite clear and they finally accept him for the awkward nerd that he is. Yay. ...So what I'm saying is that while the cutscenes are about the only decent thing this game has going for it, it wasn't always clear how they connected to each other without having seen the movie. I streamed and recorded my entire playthrough of the game here for your viewing displeasure. Don't get the wrong idea though; it's not like the entire game is cutscenes! That'd be just silly. No, the cutscenes are accompanies by one of three types of stages, which all basically amount to a single Mario Party minigame stretched to a tedious length. Dancing. It's exactly like DDR, but played with a controller. You can use a dance pad, but the other, non-dancing, minigames are virtually unplayable with a dance pad, so you're better off just sticking to a controller. All of the dance stages have three difficulties, but even on Hard, the difficulty is stupid easy. There also aren't any timing judgments for hitting the arrows, so it's either "hit" or "not hit". That's not a big deal, but I'm just saying that so you know that this DDR knock-off has absolutely no bells and whistles whatsoever. Belly Sledding. These levels are the only ones to offer any sort of fun at all. 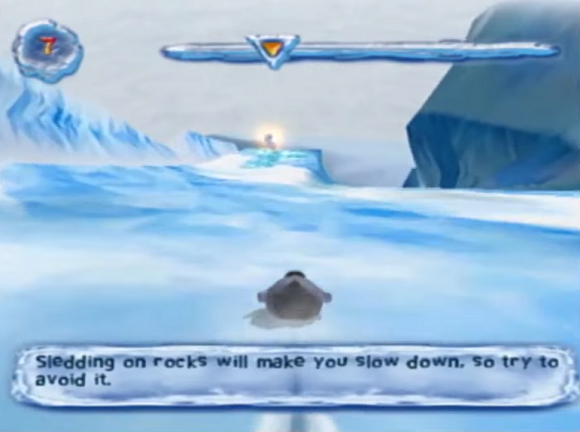 They have you sliding down snowy mountains with curves, jumps, and boosts, and depending on the stage you'll have to race another penguin, collect a certain number of objects on the way, or race against the clock by getting time extensions and checkpoints. All the sledding levels have the same arctic aesthetic, but they do have different curves and jumps if you're paying attention. You can also do a trick in the air for a speed boost and for the swag. The gameplay is still very limited, but I could see it being sufficiently entertaining for young kids (but still, there are better games out there). Swimming. In my opinion, these are the most boring stages of all. Here you're basically on-rails underwater and you have to move around the screen to collect items, hit speed boosts, collect air bubbles, or dodge attacks (on the few stages where you're fleeing a predator). It's incredibly dull. These three level types repeat for the entire game with only slight variations in goals (do it fast or do it while collecting items). None of them are particularly difficult, but I imagine that it would be possible for younger players to fail on some of the time-based stages. Lucky for them, if you fail a stage twice you'll have the option to skip it. Not that I ever saw that menu; I read about it in the manual, alright? Each level has medals you can earn according to how well you do, and getting gold medals unlocks some lame bonuses like music videos and solitaire. The only other thing to note about this game is that it has multiplayer. Two players can do the dancing stages side by side. 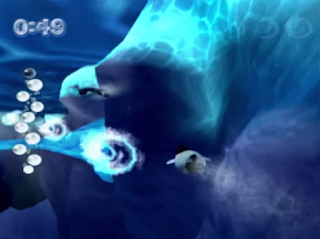 For belly sledding stages, one person sleds while the other inputs button combinations to break rock formations. Then the sledding player is supposed to slide through the newly made openings for points. And for swimming... well, you both just move around on the screen at the same time. Happy Feet is just a boring game; the worst kind of bad game. Young children who like the movie would probably enjoy it, but with a million other better games out there, there's really no reason to waste time on this one. If you made it through this review, you'd probably be interested in seeing what I rated as the top five poopiest games. They're literally games with poop in them.